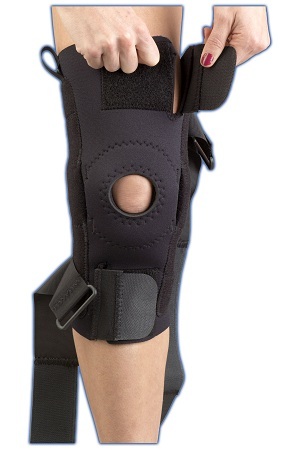 AKS (adjustable knee sleeve) Knee Support with metal hinges and nylon straps provides medial and lateral stability. AKS has the unique ability to adjust compression and fit from top to bottom. Thigh and calf openings allow for easy application, varied compression, and various patient shapes. Internal Skinloc pad and metal hinges function synergistically to resist migration and bunching. Hinge pockets are reinforced with ballistic nylon for durability. Soft horseshoe buttress is repositionable and works with central sleeve area to provide circumferential compression around the knee and focal compression around the patella. Fits either leg. Neoprene version provides greater compression and warmth. CoolFlex version is breathable and lightweight (adds + $3 to price).